On this page you will find the list of top 10 passers or topnotchers for March 29, 2015 Licensure Exam for Teachers (LET) also known as Teachers board examination as the Professional Regulation Commission (PRC) and the Board for Professional Teachers (BPT) officially released results in 38 working days after the exam. Those awaiting the results for Elementary Level may check here the name of successful examinees who garnered the highest places (topnotchers) for March 2015 LET board exams. The list includes the rank, school and average rating. 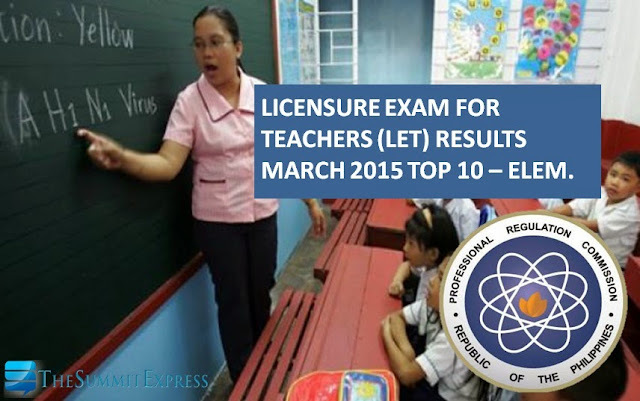 PRC announced on Saturday, May 23, 2015 that 12,103 elementary teachers out of 44,144 examinees (27.42%) and 17,904 secondary teachers out of 56,596 examinees (31.63%) successfully passed the Licensure Examination for Teachers (L.E.T.) conducted in different testing centers nationwide: Manila (NCR), Baguio, Cagayan De Oro, Cebu, Davao, Iloilo, Legazpi, Lucena, Pagadian, Tacloban, Tuguegarao, Catarman, Jolo Sulu, Bongao Tawi- tawi, Catanduanes, San Jose, Antique and Zamboanga. 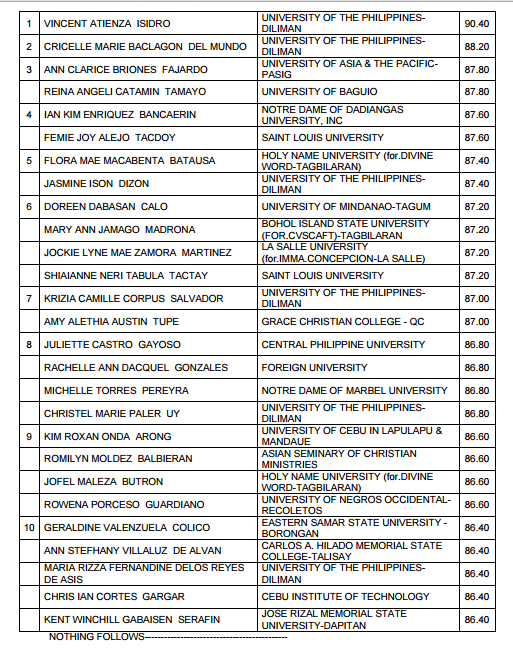 In January 2014 LET, a total of 26 topnotchers occupied the Top 10 list for Elementary level. Xavier University (XU) graduate led the 11,120 passers. In August 2014 exams, 47 LET takers were listed for the top 10 spot. Data Center College of the Philippines - Laoag City graduate topped the board. The list was dominated by colleges and universities in the provincial areas.